We had so much fun at the Purcellville 4th of July Parade. 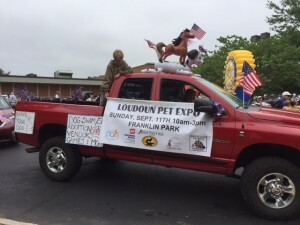 It is our hope and desire to spread the word about the Loudoun Pet Expo to as many people as possible. We have wonderful new vendors attending this year and many who are returning once again! Wildlife Ambassadors will be there as well with their exotic animals so be sure and bring your children for a chance to get up close and personal with these amazing animals. There will be demos, adoptions, a dog swim, food vendors, 5K around beautiful Franklin Park and much more. The event is free to the public but any donation made to the rescues is always so appreciated. We hope to see you at the 2016 Loudoun Pet Expo this year. Don’t forget to take home a free Program Directory!